Hmmm, never thought about the belly button... Interesting concept that of No. 1. Believable too, because don't we adapt to our environment? I believe we do. Interesting post - lots to comment on but I'll go light. I don't know how Adam & Eve were in the Garden of Eden - supposedly a more perfect creature... completely trusting of a Creator. Never read about the Fire - only that a wicked influence bade them eat the fruit. Unless fire equates with spirit(?). Supposedly humans have gone downhill since. I can't speak from that point in time, but from what I've experienced in the last umpteen years of my life - I wonder how far we can fall? We never seem to learn from our mistakes. So, is there an option # 4? I don't fit into #1-3. 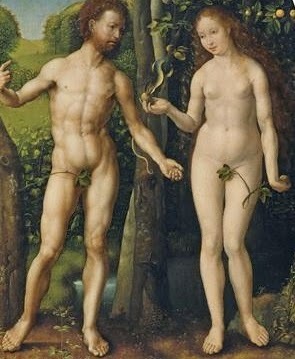 As for tummy buttons - to place them indicates human creation was not formed by a Creator - indicating normal human birth. I suppose the artist own view would answer that question. I'm undecided about Darwin and equally undecided about god. Traditional religions seem to attribute way too much to the religious view of god. The belly buttons are a weird touch!